We’re thrilled to be giving away The Wayfarers War Horse Giveaway, a Weeklong Castle Stay with The Wayfarers. On this walk with the legendary English walking company, you’ll get to explore Devon, England at the locations for Steven Spielberg’s War Horse movie. 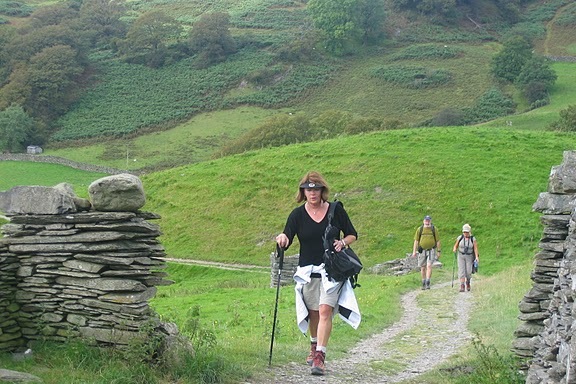 The six-night Pentillie Castle Walk in Devon and Cornwall has been organized and led by The Wayfarers, the quintessential English walking company. The Wayfarers War Horse Giveaway is for two adults, sharing and will be given away in conjunction with Everett Potter’s Travel Report, the travel website that The Wall Street Journal cites as “a terrific mix of profiles and interviews, all designed to make the best use of your travel budget.” The prize is worth $8,500. 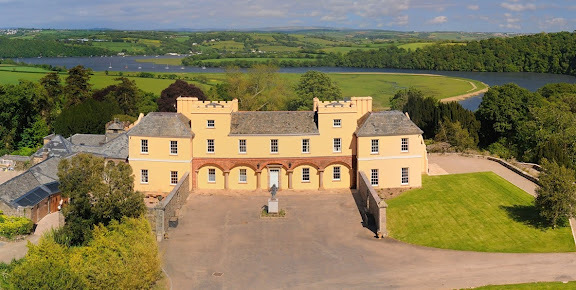 Accommodations are in the dramatic Pentillie Castle(built 1698), on the banks of the Tamar River, which forms the border between Devon and Cornwall. Based on the novel War Horse, by Michael Morpurgo, the story illustrates the true history of how horses were commandeered from the countryside across Britain and used in the World War I effort. The author lives in Devon,England, and his tale was grounded in the culture and countryside of that county. 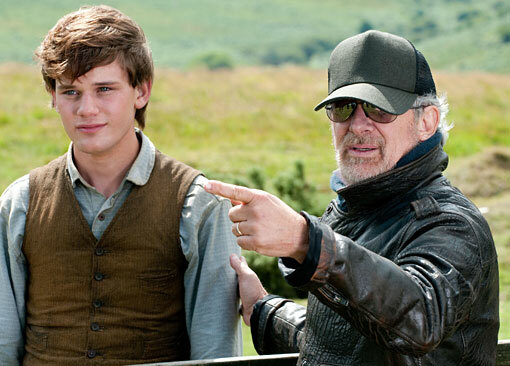 Actor Jeremy Irvine and director Steven Spielberg on the set of War Horse in Devon. Led by Muff Dudgeon, Walk Leader, and Dr Tom Greeves, Dartmoor Cultural Historian and Environmentalist, participants will visit Ringmoor Down for beautiful views of the Burrator Reservoir and the hamlet of Sheepstor. There’s also Ditsworthy Warren House, which served Spielberg as the Narracott family home and scene of Joey the horse’s formative years and triumphant homecoming. Contest winners may if they choose take a horseback ride on the Moor in the afternoon to continue in the hoof prints of War Horse (an optional extra for other participants). Visiting War Horse film sites on Dartmoor is just one day of a fantastic week-long itinerary that encompasses a tour of historic Plymouth (Pilgrim Fathers, Spanish Armada), coastal walking in Cornwall and a visit to a former home of Sir Francis Drake. Gentler coastal estates include Tudor Cotehele with its own quay and stewpond, andMount Edgcumbe with its Grade I Cornish gardens. Pentillie Castle is home for the entire week and The Wayfarers have exclusive use of the property. The giveaway, which runs from April 1 to 30, 2012, is for one Pentillie Castle Walk prize. The prize is a trip for two adults, sharing one room, on either September 23 to 29, 2012 or October 7 to 13. 2012. Airfare is not included and alternate dates are not available. The winner can use The Wayfarers travel planning services to help them organize their trip. Visit Everett Potter’s Travel Report for full contest details. Readers are invited to enter The Wayfarers War Horse Giveaway daily. The Pentillie Castle Walking Tour runs in September and October, 2012, with departures from $3,995 per person based on Double Occupancy. So enter daily for a chance to win The Wayfarers War Horse Giveaway from The Wayfarers and Everett Potter’s Travel Report. Named by National Geographic Traveler as purveyor of one of the “50 Tours of a Lifetime,” and by National Geographic Adventure as one of the “Best Hiking Companies,” The Wayfarers offers an eco-sensitive “walking” holiday of both culture and fitness in 14 countries with 46 itineraries and 80 departure dates. Now in its 29th year, The Wayfarers offers exclusive entrées into homes and gardens otherwise closed to the public, graceful accommodations, outstanding cuisine, and meetings with local residents. Walks are from 6-13 days and are rated on a five-level challenge scale. The Wayfarers is also a member of Trusted Adventures, dedicated to the highest standards of small-group travel and to giving back to the places visited. The Wayfarers. 800-249-4620. Twitter: @Wayfarers Facebook: the wayfarers. For a chance to win The Wayfarers War Horse Giveaway, just fill out the form below. Multiple entries are welcome, so come back and enter once a day through April 30, 2012. Complete rules are below. The winner will be notified by e-mail on or about May 15, 2012. Important: Please adjust your spam filter to enable receipt of e-mails with the domain EverettPottersTravelReport.com, so that we can notify you if you’re a winner. Good luck! Sorry, this giveaway has ended! Register for a chance to win The Wayfarers War Horse Giveaway. By entering, you agree to opt-in for weekly emails from Everett Potter’s Travel Report and occasional emails with information on special offers, promotions and news from The Wayfarers and Trusted Adventures. To enter, you must be at least 21 years old and a legal resident of the 50 United States, the District of Columbia, or Canada. 1. How to Enter. Between12:00pmEastern Time (“ET”) onApril 1, 2012and11:59pm ETonApril 30, 2012, (the “Giveaway Period”), you may log onto EverettPottersTravelReport.com to enter this Giveaway. To enter, fill out your full name and email on the entry form and click “Submit Now.” Entrants may enter once a day, each day, during the Giveaway Period. 2. Eligibility. Participation is open only to legal residents of the 50United States, theDistrict of Columbia, andCanadawho are 21 or older as of date of entry. Proof of age and legalUSresidency may be required. Void outside of the 50United Statesand theDistrict of Columbia, and where prohibited, taxed or restricted by law. Employees and partners of EverettPottersTravelReport.com, The Wayfarers, its subsidiaries and affiliates, and their immediate families (parents, children, siblings, spouses) or members of the same household (whether related or not) of such employees/partners are not eligible to enter. This Giveaway may only be entered in or from theUnited Statesand entries originating from any other jurisdiction are not eligible for entry. You are not authorized to participate in the Giveaway if you are not located within theUnited States. All federal, state and local laws and regulations apply. 3. Random Drawing/Odds. One (1) winner will be selected in a random drawing from among all eligible entries received during the Giveaway Period. Odds of winning depend on the number of eligible entries received. Drawing will be conducted by EverettPottersTravelReport.com on or aboutMay 15, 2012. By entering the Giveaway, you fully and unconditionally agree to be bound by these official rules (“Complete Rules”) and the decisions of EverettPottersTravelReport.com, which will be final and binding in all matters relating to the Giveaway. No credit will be extended for unused portion of the package. Package may not be redeemed for cash, resold or transferred. Gratuities are not included. Airfare is not included. The cash value of the prize is approximately $8,500. The winning prize is valid from either September 23 to 29, 2012orOctober 7 to 13, 2012. Winner’s certificate is for (2) two people sharing the same accommodations. No credit will be extended for unused portion of the package. Package may not be redeemed for cash, resold or transferred. In order to redeem the prize, the winner must contact The Wayfarers after notification fromEverett Potter’s Travel Report. Not to be used in conjunction with any other offer or promotion. Winner will receive a prize email which must be submitted at time of booking or the space is not valid. The letter will contain instructions for redeeming the prize. The prize may not be sold on eBay or any other auction site, nor may it be sold directly to anyone for cash. Otherwise, the offer becomes invalid. 5. Notification. The winner will be notified by e-mail on or aboutMay 15, 2012. If the winner does not respond to our e-mailed notification within fourteen (14) calendar days of first notification attempt, if the prize notification is returned as undeliverable, if the winner rejects his/her prize, or in the event of noncompliance with these Complete Rules, such prize will be forfeited and EverettPottersTravelReport.com reserves the right to select an alternate winner from all remaining eligible entries. Upon prize forfeiture, no compensation will be given. 6. Conditions. By entering, you agree to opt-in for weekly emails fromEverett Potter’s Travel Report and occasional emails on special offers, promotions and news from The Wayfarers. All federal, state and local taxes are the sole responsibility of the winner. Participation in this Giveaway and acceptance of prize constitutes the winner’s permission for EverettPottersTravelReport.com, and The Wayfarers to use his/her name, address (hometown and state), likeness, photograph, picture, portrait, voice, biographical information and/or any statements made by each winner regarding the Giveaway or EverettPottersTravelReport.com for advertising and promotional purposes without notice or additional compensation, except where prohibited by law. EverettPottersTravelReport.com and The Wayfarers are not responsible if the prize cannot be awarded due to delays or interruptions due to acts of God, acts of war, natural disasters, weather or acts of terrorism. Entrants who do not comply with these Complete Rules or attempt to interfere with this Giveaway in any way will be disqualified. There is no purchase or sales presentation required to participate. 8. Name of Winner. To obtain the name of the winner, send a self-addressed, stamped envelope byMay 20, 2012to:Everett Potters Travel Report Attn: The Wayfarers War Horse Giveaway Winner,146 Third Avenue,Pelham,NY10803. My daughter and I would love to win this. I would love to win this for a 15th anniversary trip for my wife and I. Love to learn, love to walk. This surely would take me out of my doldrums. this should be on everyone’s bucket list. What a pleasure this would be for my wife and me. What a dream come true to walk in the footsteps of my own Murray Clan, also!!! A trip to see where my ancestors are form!! Would love to win a trip to England!! I truly could use some good news right about now. i hope i win this. If I knew this trip existed, it would have been on my bucket list. What a dream of a trip. Looks like paradise on earth. I’d be thrilled to win this! Good luck to all!!! What a wonderful way to experience England. I have never seen a Castle in person. Seems like close to heaven. This would be such an adventurous win! Good luck all! What a dream it would be for my daughter and I to walk and ride the same paths, and see the same breathtaking scenery as our ancestors! I’m sure we, nor them would have every thought we would be drawn back one day! This would be wonderful to win as my husband and I have never had a honeymoon, and what a more magniciently magical place to begin again. what gal has not had the dream to be a princes for a while and live in a castle and to explore its domain! it is indeed mine! on my bucket list ever since I learned about it. Thi sone is fo rme! Would be lovely to win this travel getaway! I would love to win this ! I live in Hawaii and most people think we are on vacation all the time, why on earth would we want to go anywhere ? Trust me , one does get “Island Fever” and seeing the world is the best remedy. Wow! What an adventure for some lucky person! Wow. What a wonderful trip to win. I truly need this trip. my life has been hell. I’d be talking about this trip of a lifetime for months if I won! This is truly an adventurers paradise! Breathtaking scenary. I can’t get over how picturesque that view is from the castle! MANY WILL ENTER,HOPE I WIN! What a great trip this would be….My wife and I are celebrating our 25th Anniv. this year. This would be a wonderful 2nd honeymoon. Now this would be a photographer’s dream! I hope you win it Rita. How amesome would it be to win this?? 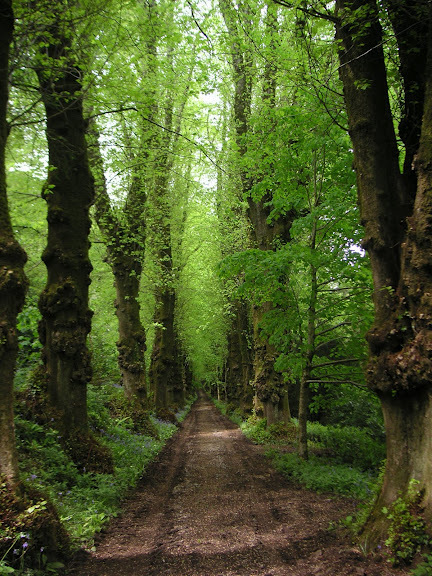 I would be so delighted to walk along Lime Avenue at Pentillie Castle, what an incredible picture, and a thrill to experience it in real life! I love to hike and this would be the ultimate trip. My wife and I love the outdoors and love to hike. This would be our dream trip. This will be a dream come true for someone! a vacation of a lifetime, for sure. WOW – this would be a trip of a lifetime. Can’t wait to see who wins this one! Good luck to all! This trip would be a dream come true! It sounds like the most fabulous trip ever. This is my dream trip…..Would love to check it off my bucket list. Would love to celebrate my 25th wedding anniversary with my wife on this awesome trip. We love to hike and the trip would be the ultimate vacation – second honeymoon for us. Oh, to be able to go on this glorious hike! I can be packed in a moments notice…what a dream trip. Whoever wins this trip is not only lucky but will experience a trip of a lifetime. I’m dreaming about it now……..pick me …. pick me …. This is an absolute paradise! Good luck to all! Sorry Ashmore’s. Only one entry/family. Thx….sorry…..I guess several of us weren’t aware of that. Good Luck to all. “Entrants may enter once a day, each day, during the Giveaway Period.” Per the rules. A weeklong castle stay……..I’m dreaming about it now. Hope I get to live it. Thanks for a great giveaway….. It sounds like a wonderful, life changing experience. I envy the person that wins this prize. What an awesome prize….beautiful countyside & the trip of a lifetime.! If I don’t win this unbelieveable trip – I hope the person that wins it, will take me along. I love to hike. Thanks for a great giveaway. Last day to enter – expires 04/30/12. Dreaming of a week long castle stay – hiking and exploring new places and meeting new people. So hoping top win this!! !